Although Switzerland has one of the highest life expectancies in the world ISPM researchers found that there are substantial geographical differences. In a study published this week in the Journal of Epidemiology & Community Health, André Moser, Radek Panczak, Matthias Egger and colleagues from ISPM and the Department of Geriatrics used data from the Swiss National Cohort, a longitudinal study of mortality based on the 2000 census to investigate life expectancy across Swiss neighbourhoods. At total of 1.3 million small neighbourhoods were included in the study. Life expectancy at age 30 years ranged from 46.9 to 54.2 years in men and from 53.5 to 57.2 years in women across Swiss neighbourhoods. These differences are in the order of magnitude of the differences observed between Switzerland and some middle-income countries, for example Cuba, Ecuador or Taiwan. 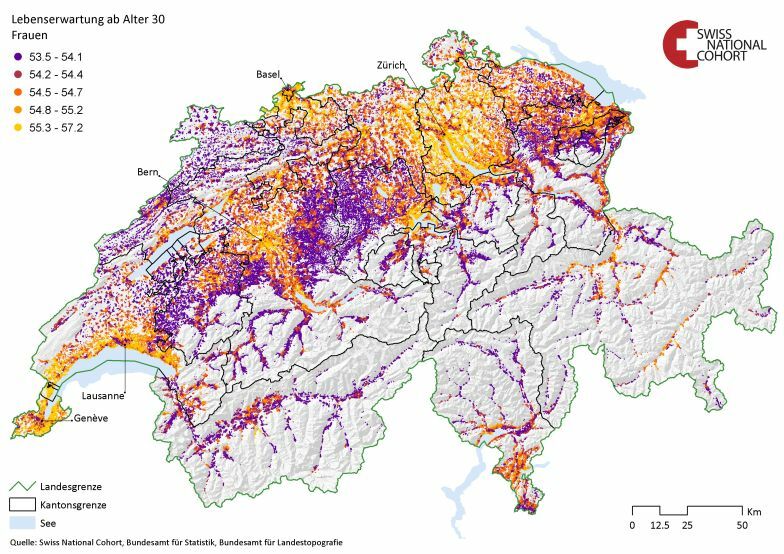 The detailed maps show that neighbourhoods of higher life expectancy were concentrated in the urban centres and along some of the lakes, for example the arc of Lake Geneva and both sides of Lake Zurich. Neighbourhoods of lower life expectancy were located north of the Alps, the area north of the lakes of Neuchâtel and Bienne in the West of the country and in valleys of the Alps. Within the major cities differences were evident at the level of streets. The association of life expectancy with the SEP of neighbourhoods, and other variables such as educational attainment, indicate that the differentials observed in this study can be reduced by policies aiming to improve the physical and social environment people live in, and health promotion targeting individual behaviours. The high-resolution maps presented here should help in the planning of such interventions and setting of priorities.